Blocked, photographed and done. The second of my '10 Shawls in 2010'. ** As you can probably tell from the photos, this thing is BRIGHT. It'll be great for rainy, overcast, dreary days. Just looking at it cheers me up. The pattern is Clapochet, made with 3 skeins of Crystal Palace's 'Mini Mochi' yarn*, and a G/4.5mm crochet hook. I modified the original pattern by increasing for 17 rows (instead of 13) to make it shawl-sized rather than a scarf. (Link to project on Ravelry here.) After blocking, my shawl measures approx. 18" wide by 68" long. Love the texture, color and drape. I think I'll get a lot of use out of this shawl. *Mini Mochi warning: Love the color and feel of Mini Mochi and 2 out of 4 skeins were great. The third started with a knot just a few yards in, then segued to wiry and dramatically overspun; a huge blob of unspun fiber; another knot; and finally mis-matched spun fibers that gave the yarn a 'barber pole' effect and a totally different color from the first 2 skeins. At that point, I took it back to my LYS for an exchange. It was so obviously bad that quality control should have spotted and yanked it out of the production line; it should never have made it to a yarn shop. The 4th skein - the replacement skein - was better than the 3rd but still overspun and wiry in spots. ** Want to see something amazingly beautiful? 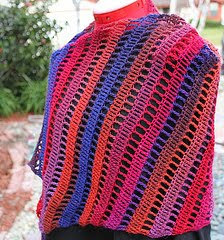 Check out all the knit and crochet shawls that have been completed in January here. Gorgeous! I like! 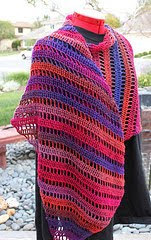 I think I might give it a shot later in the year, when it's more shawl weather.